This pattern is known to the Navahos as Son-bi-tere. I learned it from the same source as the preceding figures. In the Culin collection in the Philadelphia Free Museum of Science and Art a finished pattern, 22716, from St. Michael's Mission, Arizona, is labelled So-bide-hulonni = Horned Star. At Grand Canyon, Arizona, a Navaho called it "Cow's Head." The first five movements are the same as the first five movements of "Many Stars." Sixth: Withdraw each thumb from the loop passing around both thumb and index, and keep this loop high up on the index (Fig. 118). You now have two loops on each index and a single loop on each thumb. Seventh: With the right thumb and index pick up from the back of the left index the left lower index loop (whereof the near string passes under the thumb loop and nearest to the thumb), and lift it up, over the left upper index loop, entirely off the left index, and let it drop on the palmar side. With the left thumb and index in like manner lift the right lower index loop over the right upper index loop, entirely off the right index, and let it drop on the palmar side. 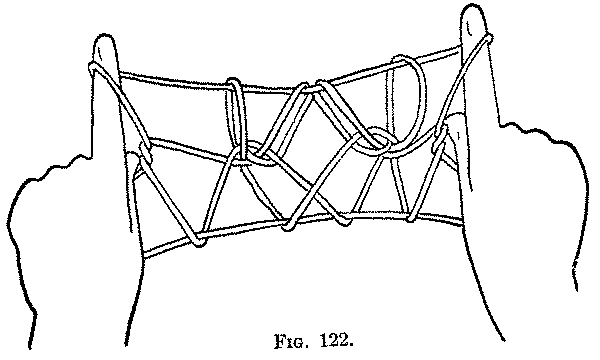 Eighth: Put each thumb from below into the index loop (Fig. 119) and, with the thumb and index of the other hand, in turn, draw the lower thumb loop over the upper thumb loop entirely off the thumb, and let it drop on the palmar side (Fig. 120). 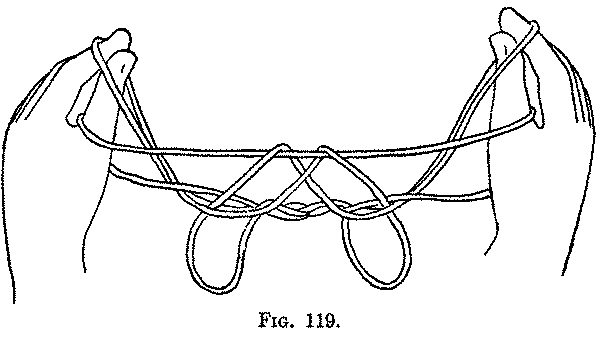 Ninth: Put each middle finger from below between the strings forming the thumb loop, and then up on the far side of the upper straight string which passes from one side to the other and forms a loop around the string running from the back of the thumb to the back of the index. 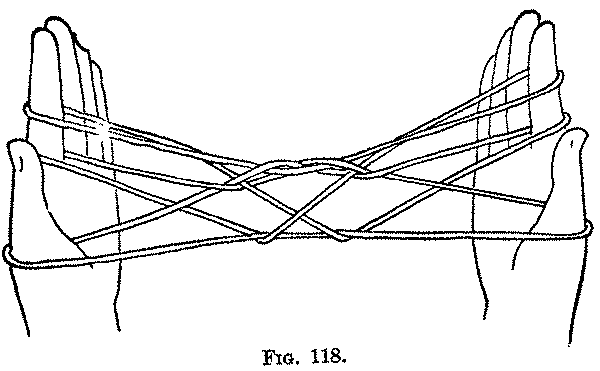 Bending the middle finger toward you over this straight string (Fig. 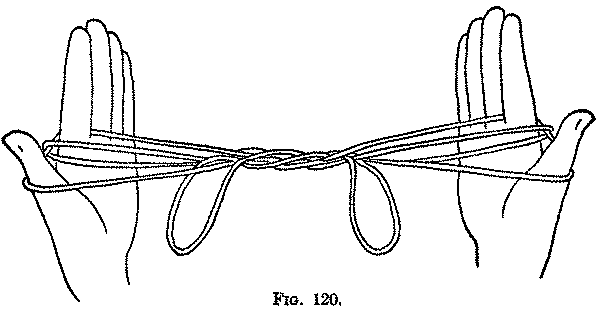 121), pull it down; release the loops from the thumbs, and draw the strings tight. The figure is extended between the index fingers and the middle fingers closed on the palms (Fig. 122). The "Two-horned Star" is a modification of "Many Stars" because in the Seventh movement the lower index loop is slipped off over the upper index loop, and in the Eighth movement the thumb loop is slipped off over the index loop.